Some people say their Facebook has too much on it and others tell me theirs has too little. On the ‘too much’ side, do you wish there weren’t so many ads and other promotional posts in Facebook? And, on the ‘too little’ side, do you wish you could be sure of seeing everything posted by good friends? What if I told you there was an easy way to accomplish both of those results in one simple feature? 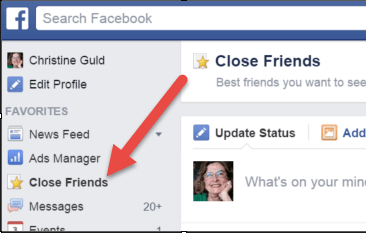 It’s called “Close Friends” and I’ll tell you exactly how to use it with Facebook on the computer as well as Facebook on mobile devices like Android Phones and iPhones or iPads. You can use a Friend list to limit who sees your posts. You can also use a Friend list to limit whose posts you see. If, instead of the everything News Feed, you select to see only your Close Friends feed, then you will be seeing ALL the posts from your Close Friends, and NOTHING BUT the posts from your Close Friends. See what I mean about it accomplishing two goals? To get back to your ‘everything’ News Feed, just click Home on a computer, or the News Feed icon on a mobile. Published by MrsGeek, in Blog. Tagged with #GeeksWhoTeach, Android, Apps for Travelers, Droid, Facebook, Facebook Close Friends, iPad, iPhone, Smartphones, Social Media, Technology for Travelers. great and informative, thanks for sharing, will use it on my news blog http://www.thekillerpunch.com/.